When quality, reliability and performance count, turn to Mydax. When your temperature control needs have special requirements, interfaces and demands, Mydax has the answers. 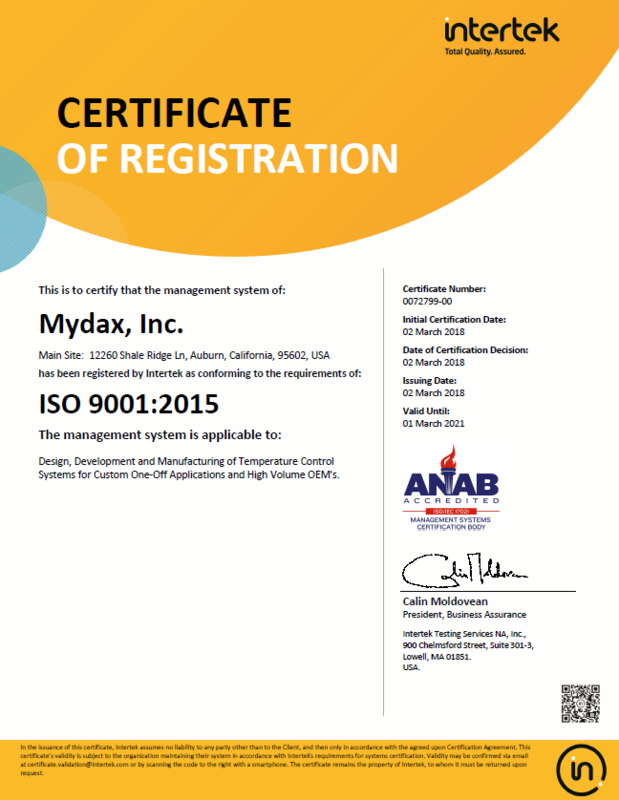 Mydax custom designs and manufactures every temperature control system to directly meet their customer’s needs, whether it’s a one of a kind custom chiller or 100+ OEM systems. Mydax stands apart from other chiller manufacturers by providing the elite chiller system on the market, utilizing patented proportional refrigeration control, rugged tubular steel frames, brazed piping and state of the art touchscreen controls. Expert use of flowmeters, pressure transducers, pulse width modulated valves and variable frequency drives allow precise temperature and fluid flow control. Long term system performance is insured by incorporating high quality components and decades of experience. Thorough system testing and a dedicated support team utilize built in diagnostic and safety devices to keep all recirculating chiller systems performing to design specifications for years. Made in USA.